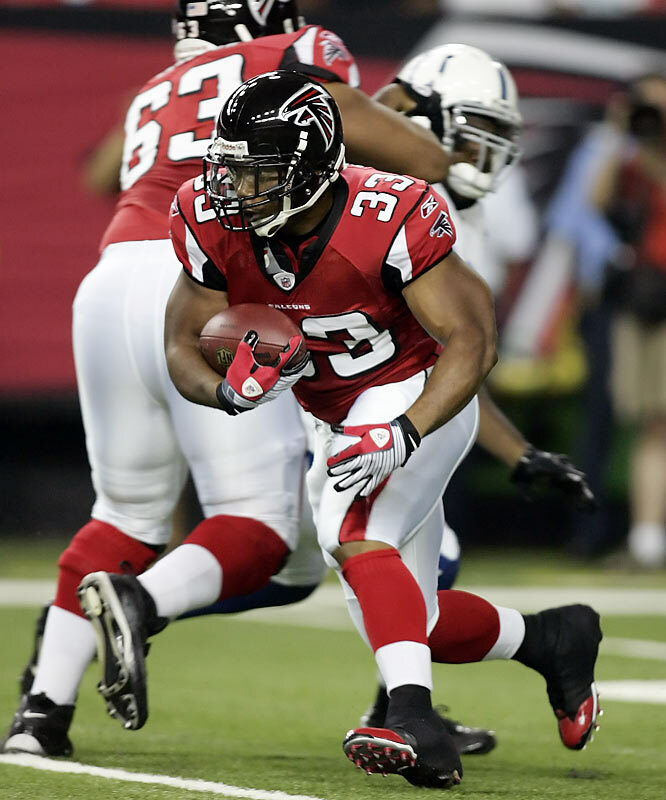 Michael Turner came over to the Atlanta Falcons via free agency in 2008 and established himself as one of the NFL’s and fantasy football’s steadiest runners. Michael Turner had shown himself to be a skilled backup behind LaDainian Tomlinson with the San Diego Chargers, but being a backup coming in against tired defenses is a far cry from being the focus of defenses. People were doubly skeptical about Michael Turner, because he signed with the (seemingly) lowly Falcons, who were widely regarded as the NFL’s least talented team coming into 2008. Bobby Petrino fled the team before one season was up, and he had been replaced by some white-haired guy named Mike Smith. Meanwhile, the Atlanta Falcons franchise quarterback was rotting in prison. Therefore, it was a huge surprise to some to see how quickly the drafting of Matt Ryan and the signing of Michael Turner turned the team around. The Falcons got to the playoffs and were a favorite to knock off the Arizona Cardinals out in Arizona in the 1st round of the playoffs. Actually, the Falcons looked to be on the way to doing so in the first half, but their inexperience hurt them in the second half of that playoff game, and they Falcons ended up falling to the eventual NFC Champions. So with that quick refresher on the Atlanta Falcons 2008 season, let’s look at the 2009 NFL season for Michael Turner. Michael Turner proved himself to be a workhorse RB in 2008. Turner posted a 220 yard game against the miserable Detroit Lions and 208 yard game against the lousy St. Louis Rams, while also compiling a 4 TD game later in the season against the much-stouter Carolina Panthers. In all, Michael Turner finished the 2008 NFL season with 1,699 yards and 17 touchdowns. If you’re drafting in a receptions league, downgrade Michael Turner somewhat, because he only caught 6 receptions in 20008. He’s just not going to catch many balls, and you can expect Jerious Norwood to do the pass-catching out of the backfield. Expect to see Norwood take a few more touches away from Michael Turner in 2009, which brings me to the main reason you have to be careful drafting Michael Turner in a fantasy football league. Michael Turner rushed 376 times last year for the Atlanta Falcons, which is somewhat beyond workhorse status. In fact, there’s a history of running backs who carry the ball more than 370 times breaking down the next year. Running backs have a hard time recovering from that kind of punishing season, where they are touching the ball just over 22 times a game. In recent seasons, players such as Larry Johnson, Shaun Alexander and Willie Parker have suffered the season after that kind of wear and tear. So did Eddie George before them. So remember that Michael Turner has those question marks surrounding him when drafting him high. Since I play mainly in receptions leagues, I tend to downgrade Michael Turner somewhat out of that Top 4 range that many leagues have him. Combine that with concerns about returning from such a huge workload and natural questions about a sophomore jinx for Matt Ryan, Mike Smith and Michael Turner, and I wouldn’t draft Michael Turner until the second half of the 1st round in most fantasy football drafts (7-10 range). If you play in a league that is touchdowns-only or doesn’t value reception stats, then consider drafting Michael Turner in the Top 5. But don’t say I didn’t tell you when he starts missing time with nagging injuries.